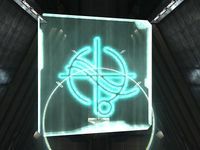 Installation 06, also known as Kappa Halo, is one of the seven rings that comprise the Halo Array. It is situated in the Perseus Arm of the Milky Way galaxy. The symbol representing Installation 06. Along with five other rings, Installation 06 was constructed at Installation 00, the second Ark installation. These Halos represented the second, more powerful array of rings in comparison to a previous series of twelve larger installations built at the greater Ark. In 2552, during the Battle of Installation 05, a signal was sent to this ring from Installation 05, putting it on standby mode. A readout from Installation 05's Control Room showed that Installation 06 was fully prepared to fire on demand. A more comprehensive readout was later observed on the Ark, showing the inner section of the ring to be covered in what appears to be barren rock during the Battle of Installation 00 by Thel 'Vadam, John-117 and the High Prophet of Truth. It once again displayed that Installation 06 was on standby mode, waiting to receive the signal to fire. However, John-117 deactivated the Installation, and the others in the Halo Array before they could be fired. The surface seems to be similar to a rocky or moon-like terrain. The Halo Encyclopedia however states that it "appears to be a ring world covered in dense forest or jungle, similar to portions of Installations 04 and 05" but that "no recordings of its surface indicate any major water sources, so how this environment maintains viability remains unknown." This is further complicated by the Encyclopedia's basic description of the ring, which states that it has "tundra surface." 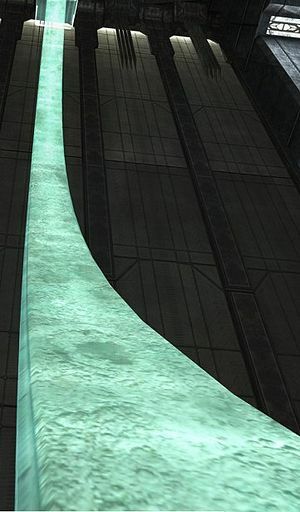 Installation 06 was referred to as "Gamma Halo" in Halo 3's texture files. However, Halo 4 officially assigned the name Gamma Halo to Installation 03. It wasn't until the publishing of Halo: Warfleet the official designation of Installation 06 was revealed.